It’s no longer avoidable – Christmas is here with a bang (or twinkle). Turkeys are being ordered and lists are being written – both by children and the jolly man in red (now, there’s a chap who has no time for control briefs!) Love is all around, everything is getting a little bit more sparkly and it may be that festive hysteria is knocking at your door. Christmas can inspire both magic and panic. 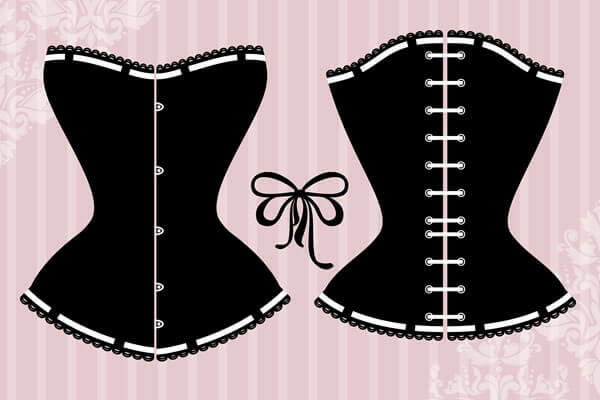 You can get your wardrobe under control from underneath with some well-selected shapewear – but what about gift shopping? This is why a Christmas market is fabulous: it’s the perfect opportunity to leap into Christmas with both feet and soak up festive cheer, and it also provides an ideal platform to blitz your Christmas shopping in one fell swoop. So fight off festive dread, take control and enjoy a weekend to do Christmas properly. You’ll find that you come out of it feeling a bit more festive and a lot more prepared! Here’s our round-up of the 12 best Christmas markets, some closer to home and some for the more intrepid traveller! Go classic and classy with a trip to Vienna this Christmas. The Viennese Christmas Market runs daily until Boxing Day and offers more than just shopping; with ice skating, curling and reindeer rides making it a great experience for all ages! For some of us, Christmas is all about chocolate! So where better to visit than Belgium’s Winter Wonders where your chocolate fix is washed down with plentiful gluhwein, beer and hot chocolate! Running through December, the Canadians have taken inspiration from European markets at The Grand Christmas Market with wooden huts, an elves’ workshop and Christmas handicrafts. If your Christmas is all about the man himself, Santa Claus Village in Lapland is the place to be. Accommodation, outlet shopping and experiences with St. Nic and his reindeer mean that you’ll return home sparkling like a bauble! Established in 1570, this is one of Europe’s oldest Festive markets. Declaring itself the ‘Capital of Christmas’, the city boasts three different themes of Christmas. So whether you seek a Magical Christmas, an Alternative Christmas, or a Secret Christmas, there’s a market for you in Strasbourg! Tivoli Gardens is a tourist destination all year round. At Christmas it ups the ante, supplementing its existing fairground rides and boutique shops and stalls with light shows and music from a roaming Pixie Band. With Christmas markets all over the city, you can’t go wrong. 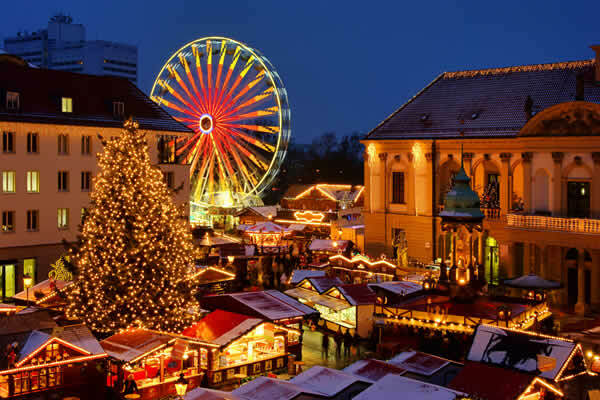 Head to Gendarmenmarkt square for the most classic Christmas market Berlin has to offer. Held beneath the impressive architecture of the Deutscher Dom and Franzosischer Dom, this market has everything: wooden huts, festive booze, beautiful and unique handcrafted gifts, and delicious food. To help increase the already amazing ambience, daily plays are held to get you into the festive spirit. The Christmas Fair and Winter Festival is the oldest market in the city. From artisan gifts to mulled wine and tasty snacks, the 100 log cabin stalls are surrounded by music, light and dancing. Not far from the capital Reykjavik, The Christmas Village is open every weekend from the end of November. Selling from little Christmas houses, you can buy anything from local Icelandic design and crafts, to traditional food and drink. The massive plus here is that while you’re in town you can relax with a dip in a geothermal pool! With around 50 stalls, the Piazza Santa Croce is a large and open market which will keep your blood pressure down when compared to some of the more frenetic markets out there. Classicism is paramount here with a nativity scene and celebration of the Feast of the Immaculate Conception. If Hyde Park’s Winter Wonderland is a little too full on, head to London Bridge for Christmas By the River. With shopping, eating, crafts and workshops available along Queen’s Walk by the river Thames, you can be sure to find something a little different here. America has its own take on Christmas, with many of us expecting the Coca-Cola truck image. However, Bryant Park takes inspiration from European styles to offer the cream of Christmas gift shopping, from jewellery to crafts across 125 stalls.